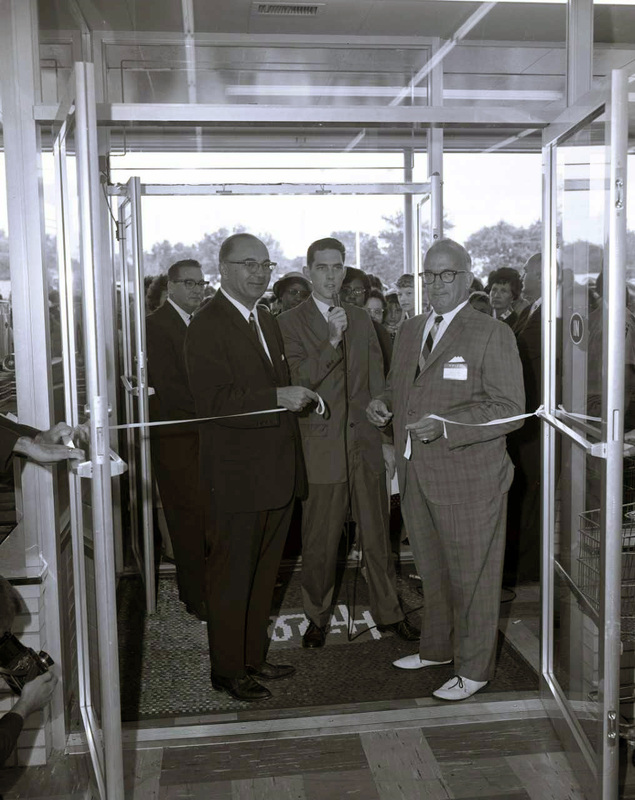 On August 14, 1963, the Hills Department Store opened in Sandusky, Ohio in the Perkins Plaza. 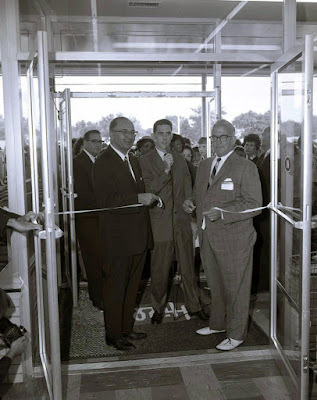 Alden Wintersteller, a local photographer, captured images of the grand opening. You can tell by the number of cars in the parking lot, that area residents welcomed the new store. Officials cut the ribbon at the front of the store. A full page advertisement for Hills appeared in the August 14, 1963 issue of the Sandusky Register. The ad stated that customers could shop between 10 a.m. and 10 p.m. in air-conditioned comfort. There was plenty of free parking, and any item could be returned for a “cheerful exchange.” Customers could cash their paychecks at no cost. The toy section in the Hills store made it seem like Christmas every day. Clothing was sold for every member of the family. Tools, sporting goods, housewares and lawn and garden equipment could all be purchased under the roof of one store at Hills. Customers in the picture below were eager to make their purchases at the new department store. Through the years, Hills Department Store had special events for its customers. Santa Claus would arrive in November, often on a fire truck, and then Santa would make his way to the “throne” in the store, where boys and girls could tell him their Christmas wish list. Fireworks were set off in the parking lot on July 4th. 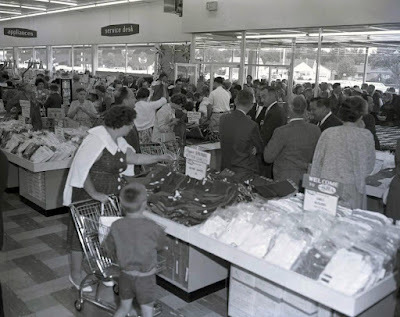 Hills was a popular place to shop for back to school clothing, and the lay-away service allowed customers to pay off the bill in weekly payments. Popcorn and Icees were favorite items at the snack shop at the front of the store. 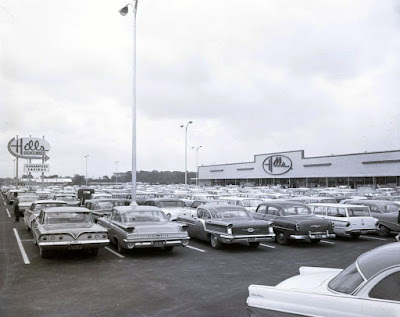 In December 1998, the Ames store chain acquired Hills, and took over operation of the former Hills store in Sandusky. By 2002, Ames went out of business. Eventually the building that was home to Hills Department Store in the Perkins Plaza was razed, but many Sandusky residents still have fond memories of the once booming department store. We use to go here quite often...loved that store when i was a kid! So many of us miss Hills, it was a great place to shop, inexpensive but not poor quality items. Everyone loved Hills popcorn. This article remeinded me how there were a number of places that shot off fireworks on the 4th of July. Hills was one, the Sandusky Mall was another. I'm sure there were more. it was nice because everyone in the city could go somewhere close by to see a good show without everyone in a scramble, trying to see fireworkd from only one location. Now, only Cedar Point does them and it's frequently too crowded, or you have to get there so early. and some people who have trouble getting aroung don't get there at all. Maybe there would be less people shooting them off in their yards if there were more public places we could go to view them, like back then. no doubt that Hills was the place to go plus they had some excellent popcorn and warm cashews, and other nuts, in the store lobby. when "cabbage patch kids" (dolls) were popular I was in the mob that happened to retrieve 2 for my younger girls. my parents bought all of our Christmas presents there and they had one heck of a selection. with Amazon taking up all the purchasing slack, it's going to take a genius to figure out how keep the current larger stores in business.